Few issues are as important as those that relate to human rights and freedoms…. We are also in a time in which international humanitarian law has been dangerously challenged. Civilians are being slaughtered and have been the targets of ongoing attacks in too many situations. These repeated attacks against civilians must cease from being perceived as collateral damage. These acts are unacceptable. Minister Freeland singled out Syria as an egregious example of atrocities against civilians by the Assad regime. She raised cases of human rights abuses and lack of accountability in Venezuela, Egypt, Sri Lanka, and North Korea. But not a word about Yemen. Not a word about a conflict where civilians including children are repeatedly targeted by the Saudi-led coalition and where their illegal economic blockade has put 14 million Yemenis at imminent risk of starvation. The latest atrocities include Saudi troops firing on civilians demonstrating against the presence of foreign forces in their land and buses of fleeing citizens being targeted by air strikes. Yemen is not a theoretical case for Canada. Canadian-build armoured vehicles (called “light” but in fact heavily armoured) have been used by Saudi Arabia throughout its war in Yemen. The time has long come for Canada to join countries like Germany, Belgium, Finland, Norway, and Sweden, and suspend its military assistance to parties to the conflict in Yemen. Yet, all we continue to hear from the Prime Minister and Foreign Minister are excuses for why Canada cannot end this unconscionable military assistance to Saudi Arabia. Jobs could be affected, penalties might be incurred, our reputation as a good supplier might be sullied. The government is seeking to mute criticism by telling us they are considering sanctioning certain Saudi individuals implicated in the barbaric murder of journalist Jamal Khashoggi, now that the Trump administration has done so. Of course, this action would not in any way address the role of Crown Prince Mohammed bin Salman, who almost certainly ordered the gruesome assassination, and who is also responsible for the Saudi military intervention in Yemen. In short, these proposed sanctions will do nothing to help end the war in Yemen nor to stop the awful Canadian complicity in that war. If you have not already done so, please sign the Ceasefire petition to end arms exports to Saudi Arabia by clicking here. 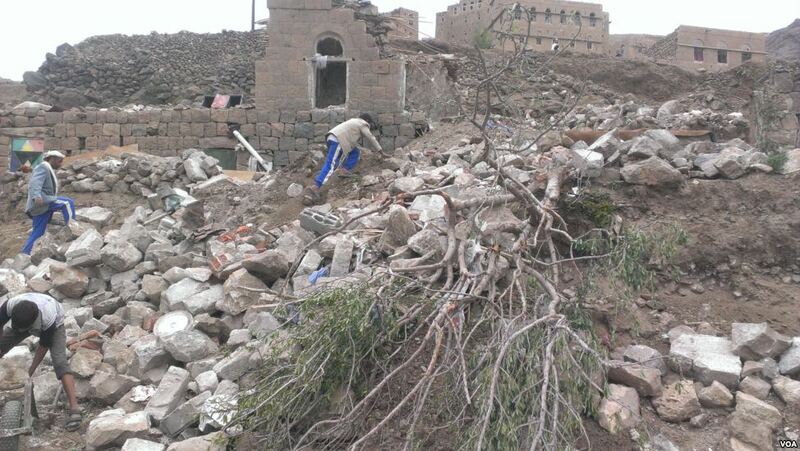 Photo credit: Wikimedia (Yemeni home that was bombed, killing four children and four adults).